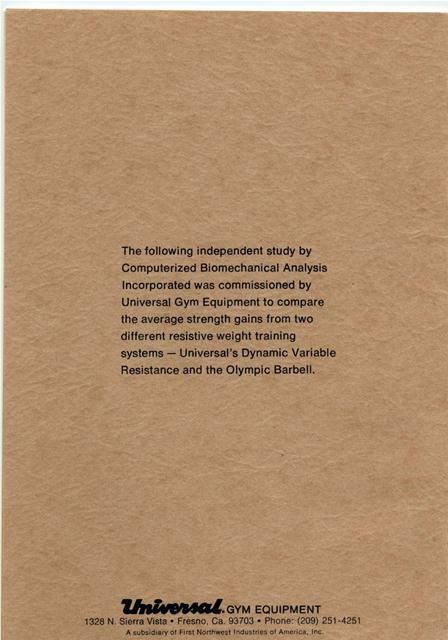 The following independent study by Computerized Biomechanical Analysis Incorporated was commissioned by Universal Gym Equipment to compare the average strength gains from two different resistive weight training systems - Universal's Dynamic Variable Resistance and the Olympic Barbell. A subsidiary of First Northwest Industries of America, Inc. The relationship between resistance exercises and muscle strength has been known for centuries. In ancient Greece, Milo, the Greek wrestler, used progressive resistance exercises to improve his strength. 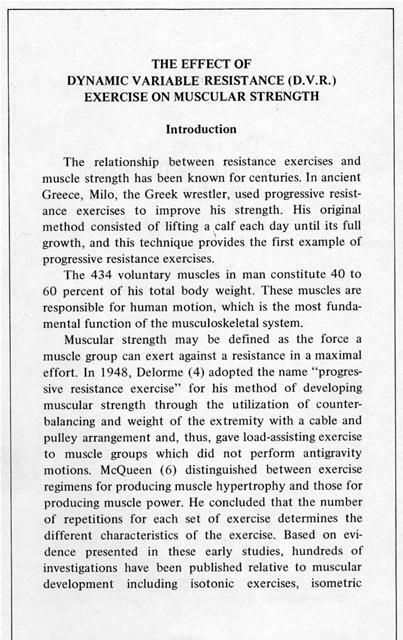 His original method consisted of lifting a calf each day until its full growth, and this technique provides the first example of progressive resistance exercises. The 434 voluntary muscles in man constitute 40 to 60 percent of his total body weight. These muscles are responsible for human motion, which is the most fundamental function of the musculoskeletal system. exercise, eccentric contraction techniques, Oxford technique, double and triple progressive super set system, and many others. Each system has been supported and refuted by numerous investigations. 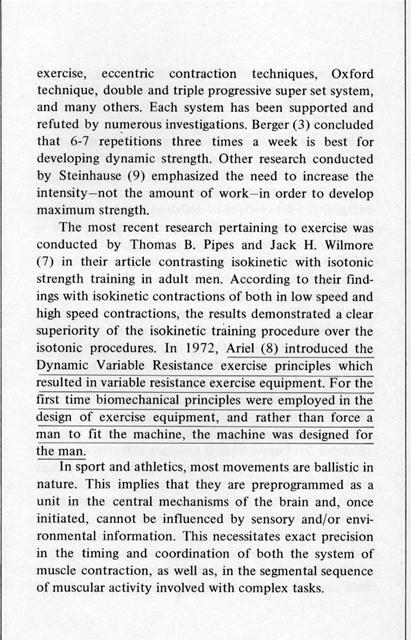 Berger (3) concluded that 6-7 repetitions three times a week is best for developing dynamic strength. Other research conducted by Steinhause (9) emphasized the need to increase the intensity-not the amount of work-in order to develop maximum strength. man to fit the machine, the machine was designed for the man. In sport and athletics, most movements are ballistic in nature. This implies that they are preprogrammed as a unit in the central mechanisms of the brain and, once initiated, cannot be influenced by sensory and/or environmental information. This necessitates exact precision in the timing and coordination of both the system of muscle contraction, as well as, in the segmental sequence of muscular activity involved with complex tasks. sue, is an important contributing component of training. athletic performance, many exercise equipment manufacturers have developed various types of devices employing isometrics and isokinetics. These isometric and isokinetic devices inhibit the natural movement patterns of acceleration and deceleration. However, when considered as a separate entity, force is only one factor influencing successful athletic performance. In all motor skills, muscular forces interact to move the body parts through the activity. The displacement of the body parts and their speed of motion are important in the coordination of the activity and are also directly related to the forces produced. However, it is only because of the control provided by the brain that the muscular forces follow any particular displacement pattern, and without these brain center controls, there would be no skilled athletic performances. In all athletic events, the intricate timing of the varying forces is a critical factor in successful performances, and therefore, training an isolated muscle group slowly or at a constant speed may result in poorer athletic performances. exercise such as the bench press, there is a point where the resistance is maximum and below or above this point the resistance is less. This fact illustrates the important phenomenon that throughout an exercise stroke, the muscle is working at its maximum potential during a very small range of motion. To facilitate maximum muscular involvement it is necessary to vary the resistance. In some exercises, this resistance should vary by as much as 100 percent in order to maintain the moment of force at its maximum. The resistance should be varied according to biomechanical data obtained under dynamic conditions. 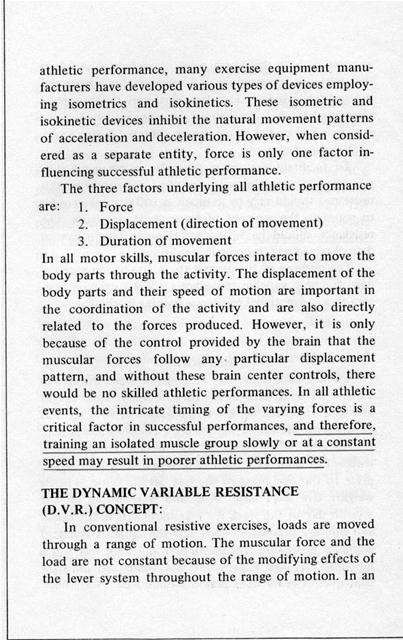 The purpose of the present study was to compare the new dynamic variable resistance (D.V.R.) exercise concept to a conventional resistance training method. Twenty male University students between the ages of 19 and 23 were used in the present study. Their height averaged 181.5 cm. with a mean weight of 91.4 kg. The experiment was conducted during a twenty week period. All subjects were athletes with weight training experience of at least two years. For a period of four weeks prior to the beginning of the test, all the subjects lifted weights five days each week and were tested on the seventh day of the week for maximum lifts in the bench and military presses, the curl, and the squat. A standard warm-up procedure was performed and each test was a maximal lift. The experiment was conducted during a subsequent twenty week period. Subjects trained five times per week for approximately two hours each training session, according to a program designed to work the major muscle groups of the body utilizing a progressive over-load principle. The program consisted of bench press, military press, squat, and curl exercise. Each exercise was performed in sets of four with an increased load following a pyramidal increase. Each set consisted of a decreasing number of repetitions from 8 to 3. Weights were increased as rapidly as possible to maintain the training at maximum effort. The training programs for both groups were identical with the only difference being the exercise equipment. Constant supervision of workouts was maintained at all times. Testing was conducted every six days until the conclusion of the study. 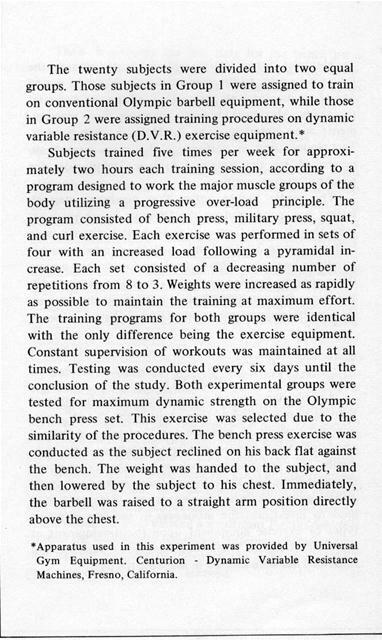 Both experimental groups were tested for maximum dynamic strength on the Olympic bench press set. This exercise was selected due to the similarity of the procedures. The bench press exercise was conducted as the subject reclined on his back flat against the bench. The weight was handed to the subject, and then lowered by the subject to his chest. Immediately, the barbell was raised to a straight arm position directly above the chest. 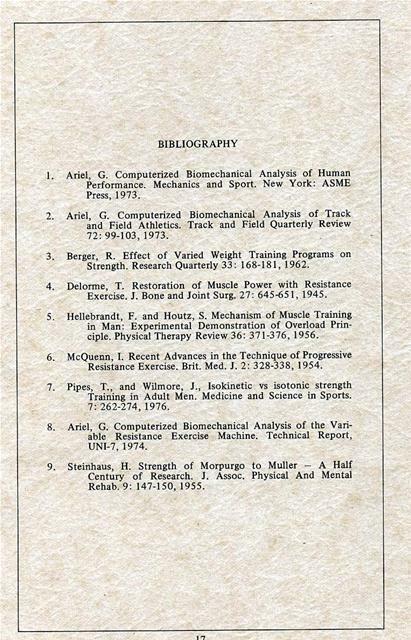 Muscular force testing was conducted during the four weeks prior to the start of the experimental period and at six day intervals thereafter until the conclusion of the study. Maximum dynamic muscular force measurements were determined by I-RM in the bench press. Techniques used in performing the press were those prescribed by the Amateur Athletic Union piles for weight-lifting competition. 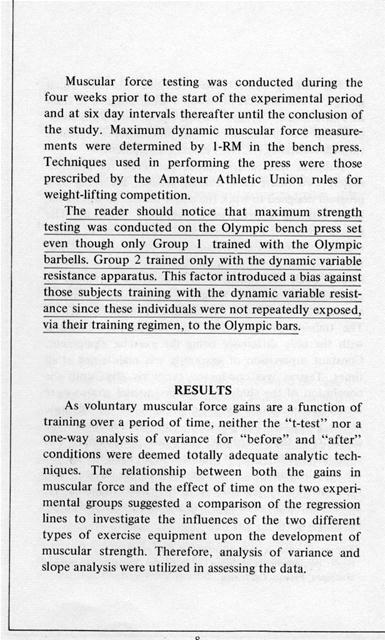 The reader should notice that maximum strength testing was conducted on the Olympic bench press set even though only Group I trained with the Olympic barbells. 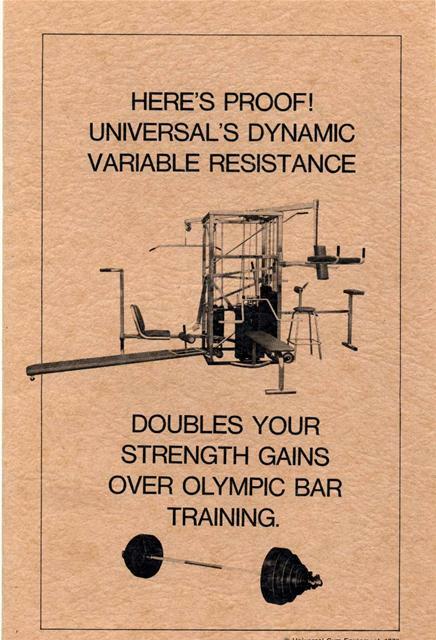 Group 2 trained only with the dynamic variable resistance apparatus. 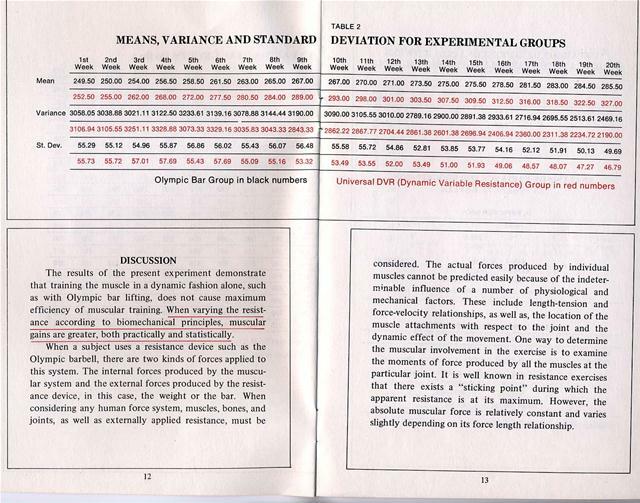 This factor introduced a bias against those subjects training with the dynamic variable resistance since these individuals were not repeatedly exposed, via their training regimen, to the Olympic bars. As voluntary muscular force gains are a function of training over a period of time, neither the "t-test" nor a one-way analysis of variance for "before" and "after" conditions were deemed totally adequate analytic techniques. The relationship between both the gains in muscular force and the effect of time on the two experimental groups suggested a comparison of the regression lines to investigate the influences of the two different types of exercise equipment upon the development of muscular strength. Therefore, analysis of variance and slope analysis were utilized in assessing the data. Table I presents the raw data for the bench press exercise. 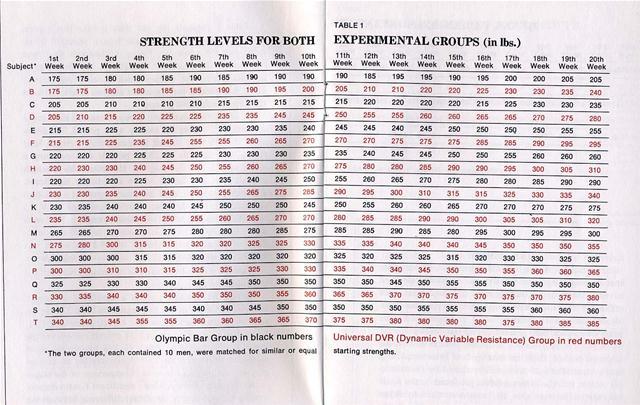 Table 2 illustrates the means, standard deviations and the variances. Figure 1 illustrates the mean changes in the muscular strength in the bench press exercise during the twenty week experimental period. Table 3 illustrates the regression analysis results between the two experimental groups. It was found that both groups increased their mean strength level during the twenty week period. The group using the Olympic barbell increased their strength level from 249.5 pounds to 285.5 pounds demonstrating a mean change of 36 pounds. However, this strength increase was not found to be statistically significant, although such a strength gain may represent a practical significance.. 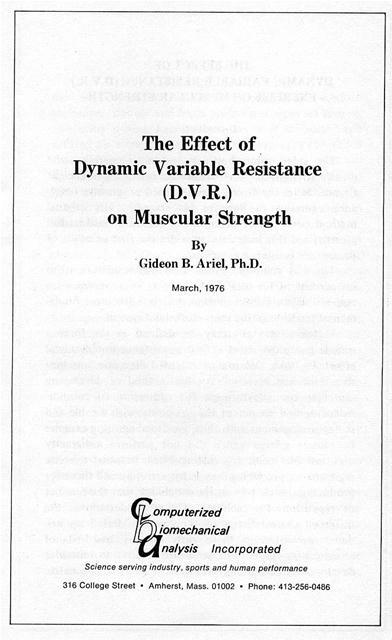 The dynamic variable resistance (D.V.R.) exercise group increased their mean strength in the bench press exercise from 252.5 pounds to 327.0 pounds demonstrating a mean change of 74.5 lbs which was statistically significance, as well as, practical significance. Table 4 revealed the analysis of variance between the beginning and the last period. Regression analysis yielded a significant difference between the slope of the two regression lines. 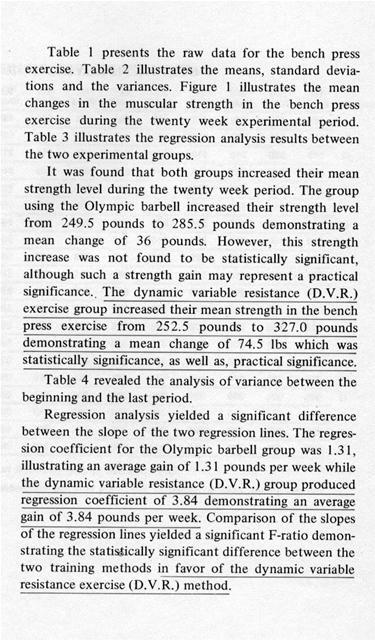 The regression coefficient for the Olympic barbell group was I.31, illustrating an average gain of 1.3 1 pounds per week while the dynamic variable resistance (D.V.R.) group produced regression coefficient of 3.84 demonstrating an average gain of 3.84 pounds per week. 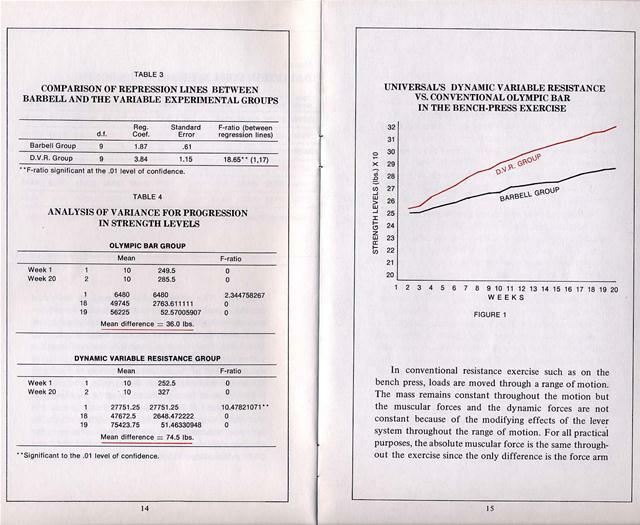 Comparison of the slopes of the regression lines yielded a significant F-ratio demonstrating the statistically significant difference between the two training methods in favor of the dynamic variable resistance exercise (D.V.R.) method. gains are greater, both practically and statistically. on which the muscle pulls. When the force arm changes due to the angular changes of the limb, the muscle can lift a variable load. This explains why when performing an exercise such as the bench press, there is a point where the resistance is maximum and below or above this point the resistance is less. This fact illustrates the important phenomenon that throughout an exercise stroke using conventional Olympic barbells, the muscle is working at its maximum potential during a very small range of motion. Another factor to consider in muscular training is the dynamic characteristics of the motion. 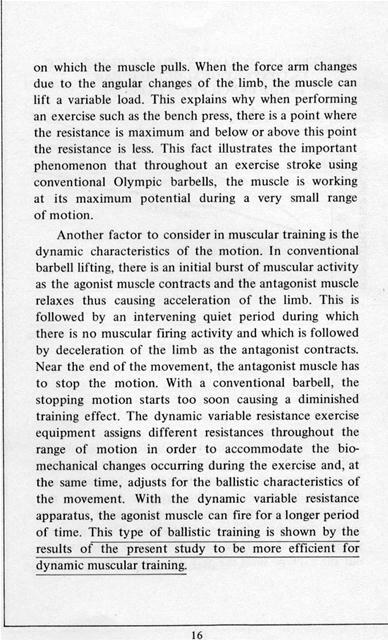 In conventional barbell lifting, there is an initial burst of muscular activity as the agonist muscle contracts and the antagonist muscle relaxes thus causing acceleration of the limb. This is followed by an intervening quiet period during which there is no muscular firing activity and which is followed by deceleration of the limb as the antagonist contracts. Near the end of the movement, the antagonist muscle has to stop the motion. With a conventional barbell, the stopping motion starts too soon causing a diminished training effect. The dynamic variable resistance exercise equipment assigns different resistances throughout the range of motion in order to accommodate the biomechanical changes occurring during the exercise and, at the same time, adjusts for the ballistic characteristics of the movement. With the dynamic variable resistance apparatus, the agonist muscle can fire for a longer period of time. This type of ballistic training is shown by the results of the present study to be more efficient for dynamic muscular training. 1. Ariel, G. Computerized Biomechanical Analysis of Human Performance. Mechanics and Sport. New York: ASME Press, 1973. 2. Ariel, G. Computerized Biomechanical Analysis of Track and Field Athletics. Track and Field Quarterly Review 72: 99-103, 1973. Strength. Research Quarterly 33: 168-181, 1962. 4. 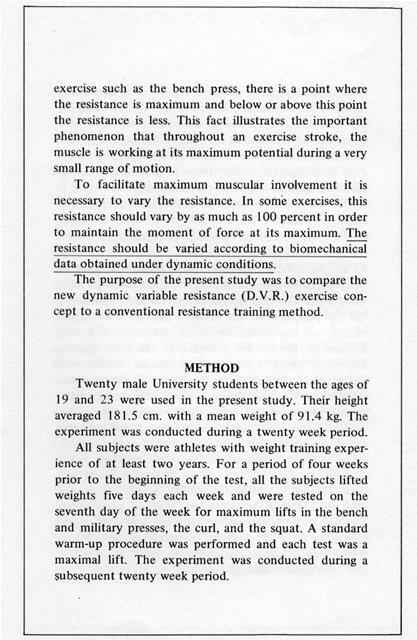 Delorme, T. Restoration of Muscle Power with Resistance Exercise. J. Bone and Joint Surg. 27: 645-651, 1945. 5. 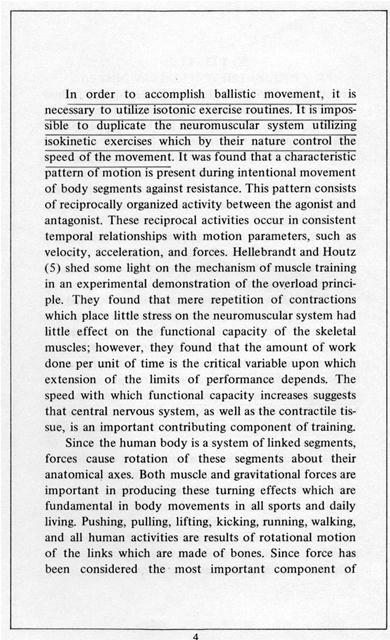 Hellebrandt, F. and Houtz, S. Mechanism of Muscle Training in Man: Experimental Demonstration of Overload Principle. Physical Therapy Review 36: 371-376, 1956. 6. McQuenn, I. Recent Advances in the Technique of Progressive Resistance Exercise. Brit. Med. J. 2: 328-338, 1954. 7. Pipes, T., and Wilmore, J., Isokinetic vs isotonic strength Training in Adult Men. Medicine and Science in Sports. 7: 262-274, 1976. 8. Ariel, G. Computerized Biomechanical Analysis of the Variable Resistance Exercise Machine. Technical Report, UN1-7, 1974. 9. Steinhaus, H. Strength of Morpurgo to Muller - A Half Century of Research. J. Assoc. Physical And Mental Rehab. 9: 147-150, 1955. Generated on 4/22/2019 1:29:54 PM (PST) ADI/HQ/GBA/2019/ARIELCLOUD/v3.0.2018.0126.